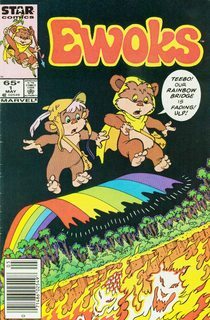 Did Lucas always intend the Ewoks to be specifically for children? 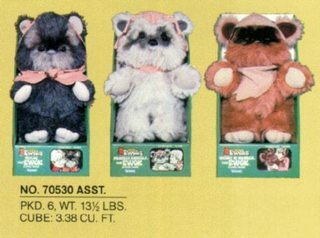 It's no argument that for a while, the Ewoks were heavily marketed towards children. However, at least to me, their appearance in Return of the Jedi doesn't really gel with their later cutesy, innocent demeanors. They are all armed and totally down for violent warfare. THREEPIO: I'm rather embarrassed, General Solo, but it appears you are to be the main course at a banquet in my honor. They're inspired by the Viet Cong. Given that the Endor natives were originally going to be Wookiees, it further complicates things. When Lucas originally created the Ewoks, was their appeal to children a factor? It does appear that Lucas meant for them to at least be more child-accessible, if not for children. According to People, Lucas specifically told the director that they should be "cuddly". He also wanted the Ewoks to be more approachable than the other aliens in his bestiary. "Keep them a little cuddly, so we want to hug them a little," he advised Jedi director Marquand. But when Lucas first saw the Ewok costumes, he thought they had a case of the "terminal cutes." The performers weren't thrilled, either. Recalls 3'4" Margarita Fernandez, 24, "When we first looked at each other as Ewoks, we thought 'Yuk.' Then they began to grow on us." The article goes on to make an unsourced (but believable) claim that they were designed to be marketed towards children. 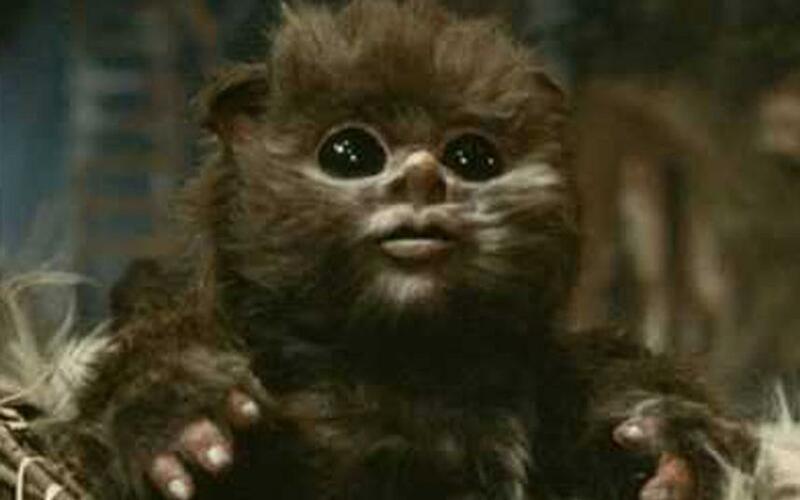 The movie Ewoks were designed with an eye to having the appropriately furry 'n' fuzzy appeal to little consumers. Speaking more broadly, Lucas once said that Jedi was "designed for kids", so it's fair to say that the Ewoks were designed to at least be child-accessible. Jedi is almost incomprehensible in certain areas. It's designed more for kids...The plot runs along for a five-year-old who doesn't understand any of the machinations of the thing. But you can go back and look at it again and still find it interesting. It's sometimes hard to say because George Lucas retcons George Lucas so often you can never really tell what he intended anymore. "The movies are for children but they don't want to admit that. In the first film they absolutely hated R2 and C3-PO. In the second film they didn't like Yoda and in the third one they hated the Ewoks... and now Jar Jar is getting accused of the same thing." I mean you're calling out marketing to kids some cuddly little savages. If you step back and think about it, virtually nothing about the Star Wars universe is really kid friendly. Han Solo kills a bounty hunter in cold blood. Luke's aunt and uncle are massacred and he has to cremate their bodies (I had to explain that one to my kids). Ironically, my kids had few issues with the Ewoks because they were, indeed, cute. Lucas originally made Endor for the Wookiees, but wanted a primitive culture to overthrow the Empire (Wookiees could, you know, fix starships). So you've got to invent a new race here. But the video makes it sound like pre-retcon Lucas was taking a pragmatic step and just took one furry race, made them shorter, and called it another furry race. I doubt very much that marketing wasn't far from his mind(Lucas is a master at marketing toys), but, as you note, the troubling aspects of their society make them far from perfect kid subject matter. All of the kid specific stuff that came afterwards just avoided the subject (most notably the two Ewoks live action made-for-TV movies, neither of which depicted them as pure savages). I mean, who can't forgive the whole "we eat humans" thing after seeing this face? Not the answer you're looking for? Browse other questions tagged star-wars behind-the-scenes return-of-the-jedi george-lucas ewoks or ask your own question. Were the Ewoks already planning an offensive or revolt? 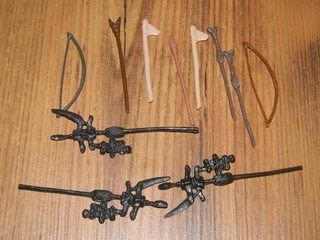 Why do the Ewoks have weapons of war? 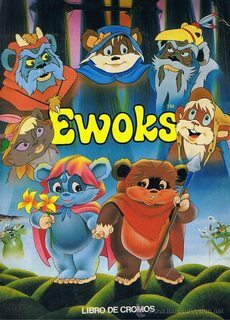 Is the species name “Ewoks” simply “Wookiees” with the syllables reversed? Did the Ewoks continue to think C-3PO was a god? Why didn't the Ewoks attempt to kill Leia? Why did the Ewoks think C-3PO was a god? Did Lucas intend to continue the story beyond Episode VI? What rules did Lucas have for the Expanded Universe? What was the actual relationship between George Lucas and Richard Marquand? Did George Lucas always intend for the 'exhaust port vulnerability' to have been an act of sabotage?